Sometimes the most basic facts hold the most power. We often talk about pretty specific issues when it comes to car accidents, but we shouldn’t forget the big picture. In this post, our Bay Area car accident lawyer and his team look at some general car accident statistics, numbers that we always remember represent real people and real lives. We also remind readers why every victim injured or killed by another driver’s negligence deserves the help of an experienced accident attorney. Before turning to these difficult statistics, we want to highlight a local “win.” The San Jose Mercury News reported that police in San Mateo County made only eight arrests on suspicion of drunk driving this past Thursday and Friday, the opening half of a holiday weekend campaign against drunk driving. In contrast, they made 17 arrests during the same time span last year. A Daly City Police Department representative indicated no alcohol-related crashes were reported in the county during the period this year. This May, the National Highway Safety Traffic Administration released Quick Facts 2012, a bare-bones look at the most recent traffic accident statistics. Representing a relatively small increase from the prior year, 2012 saw 30,800 fatal crashes that claimed 33,561 lives nationwide. The year also saw approximately 2,362,000 people injured in vehicle accidents, an increase over the injury figures for 2010 and 2011(2,239,000 and 2,217,000, respectively). Notably, the data restated as “Clock Facts” can feel more powerful. 2012 saw an average of 6,454 injuries and 92 deaths per day. These numbers became painfully real when one recognizes that every “1” is a unique person with a unique story whose life was altered, from an annoying sprain to a lost limb and chronic pain, or even ended. 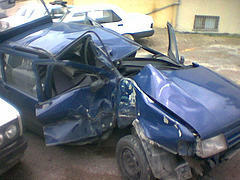 Car accidents are, to speak simply, far too common. However, even if they seem like every-day incidents and a particular case seems straight-forward, an attorney should still be consulted when an injury or death is the result of another person’s negligent or wrongful acts. Attorney Brod knows the applicable laws/policies and can ensure all procedural requirements are met. He also has the experience to help determine a fair settlement value and, while most cases do settle, the expertise to take a case to trial if needed. Insurance companies often try to get unrepresented injured parties to make a statement or agree to a low-ball settlement that is in the insurance company’s best interest, not the victim’s. They do this every day; just think about the accident figures above! Don’t fall into that trap. People injured in accidents that were not their fault deserve legal counsel, as do families left grieving by another driver’s actions. If you are in Northern California, call to schedule a free consultation at our injury law offices in Santa Rosa, San Francisco, San Jose, or Oakland. We can help.